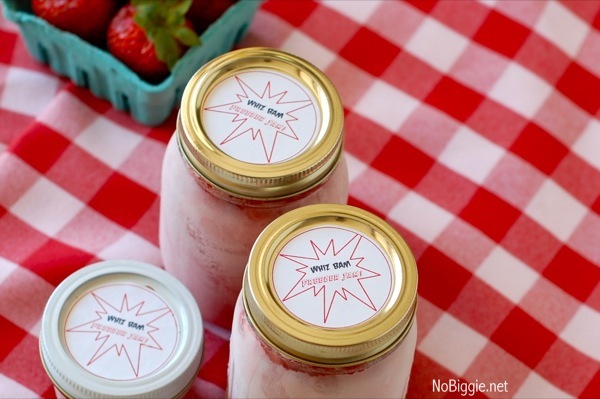 Tips and tricks plus the recipe for Strawberry Freezer Jam. We’re big fans of strawberry freezer jam at our house. We’ve been spoiled with it for years from my wonderful Mother in Law. It’s so easy to make at home and it always tastes way better than anything you can buy in the store. Fresh strawberries are basically available almost year round, but when they go on sale…you’ve got to make a bunch of strawberry freezer jam! Why make freezer jam rather than a cooked jam? Because it’s so fast and easy! I loved this list of pros and cons for making freezer jam vs. a cooked jam. Why use pectin to make jam? Pectin helps to bind the sugar with the acid of the fruit to form a gel. Adding pectin when making jam (or jelly) helps to shorten the cooking time, resulting in a more fresh strawberry flavor. Besides the ingredients for the recipe, these things are helpful before you start to make freezer jam. How long is freezer jam good for in the fridge? Once thawed out from the freezer to the fridge, your jar of freezer jam will last a full month in the fridge. 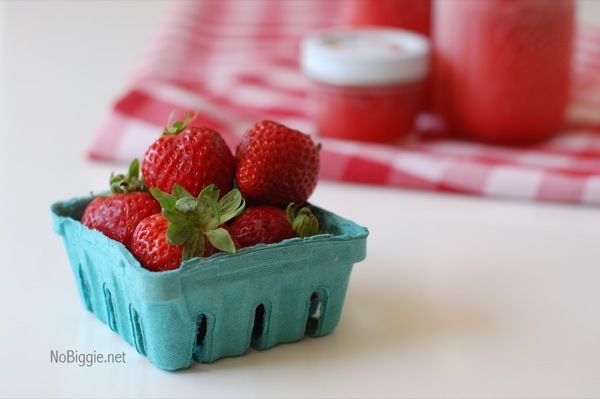 You just can't beat homemade Strawberry Freezer Jam, it's so much better than store bought jams and jellies. Prepare the mason jars or the containers to store the jam by rinsing them in hot water and drying them well before you use them. In a large bowl mix together the pureed strawberries with the sugar. Stir for 5 minutes until all the sugar has dissolved. Let this mixture sit for 10 minutes longer. In a small sauce pan set on high heat, whisk together the water and the pectin. Bring this mixture to a boil for one minute. Pour this hot mixture all over the pureed strawberries and stir it all together for 5 minutes until completely combined. Fill the jars while the mixture is still warm. When filling the jars, leave about a 1/2 inch head space at the top of each jar for possible expansion in the freezer. Screw the lids onto the jars. Let the filled jars sit at room temp for 24 hours before placing them into the freezer. When ready to use your freezer jam, move a jar of jam to the fridge for 24 hours to thaw out. The jam stores in the freezer for 3-6 months, and in the fridge for up to 1 month. 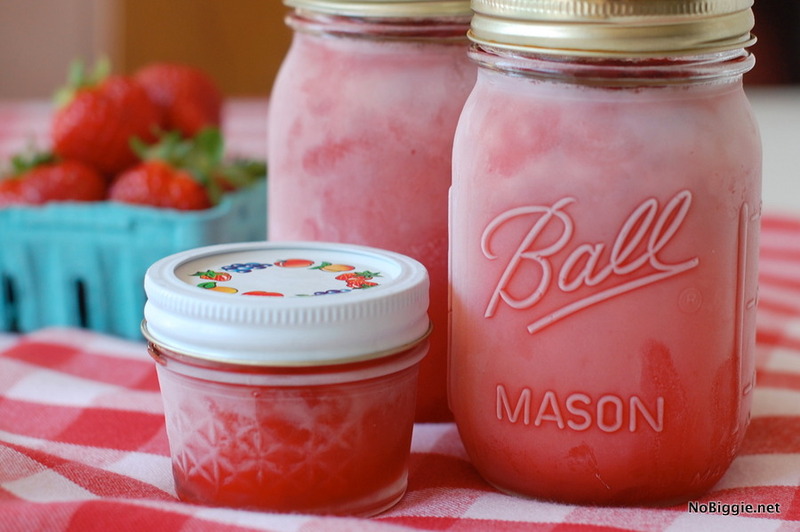 Can you use glass jars for freezer jam? Yes! Just make sure it is freeze safe tempered glass, most brands of mason jars are freeze safe glass. One of the great benefits to freezer jam is that you don’t need it to “seal”, so technically you can use any stackable plastic container with a lid. 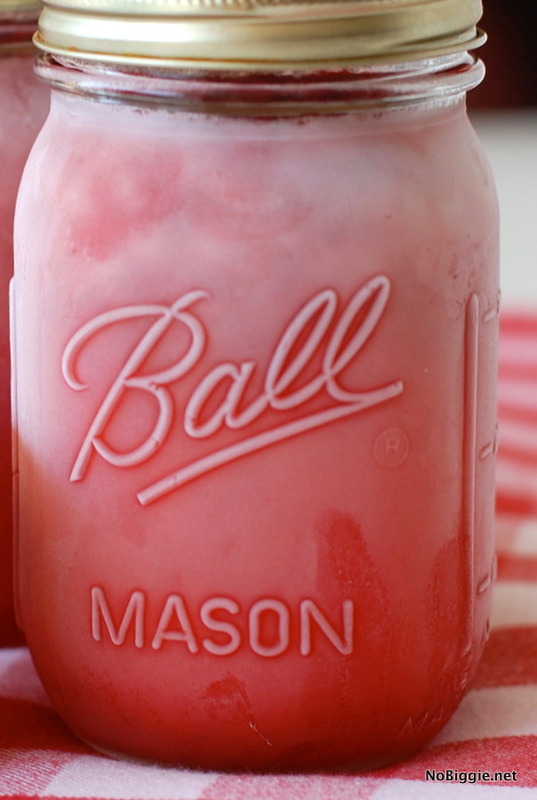 We just think the glass mason jars are the cutest. 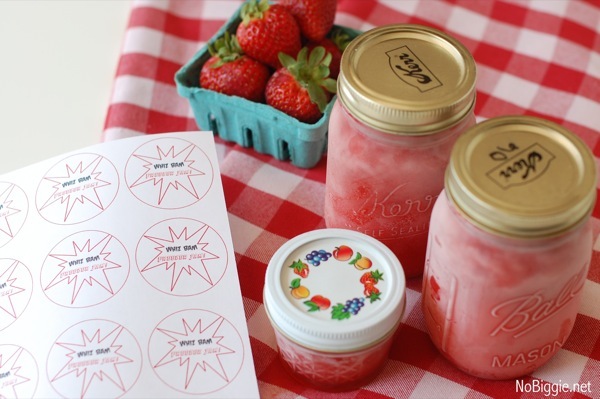 We made a fun printable label to go with your freezer jam. You will need a 2 inch circle craft punch to cut them out, either a craft punch or a cutting die, or you could just do it with scissors. You might want to laminate these labels to keep them from getting wet with condensation in the freezer, or just include them like a gift tag when you are ready to deliver. Just stick them on and write a message on the back side. 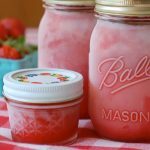 Strawberry freezer jam is a great thing to have on hand at all times in your freezer for your own family, but it also makes a nice neighbor gift, hostess gift or a cute “welcome to the neighborhood” gift. 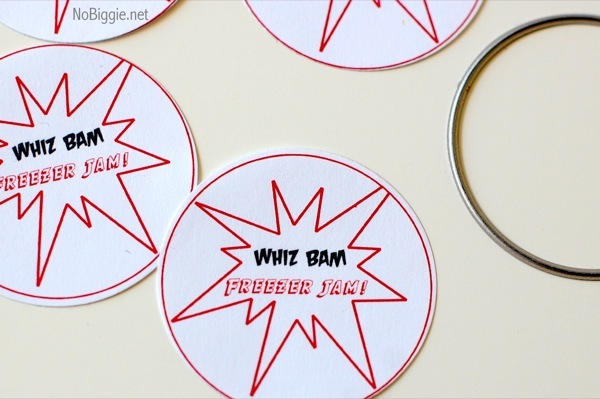 Looking for more fun printables like this? Visit our Printables Page to see them all.